December 20, 2013, 6:44 pm (OFPR) — Travel and relocation website 2Vancouver.com has launched a new business matchmaking service to enhance the online support it provides to newcomers and travelers in Vancouver, Canada. December 9, 2013, 12:10 pm (OFPR) — The Quest Trend Magazine has published the market shares of real time Ethernet from 2005 to 2012 and the planning of the machine-builders until 2015. This concerns EtherCat, Ethernet IP, Modbus TCP, Powerlink, ProfiNet, Sercos III and VARAN. December 5, 2013, 1:20 am (OFPR) — Colos-Saal from Aschaffenburg, Frankfurt, revealed this week their unique social event promotion and social ticketing app developed by Evento Social Promotion. November 28, 2013, 4:55 pm (OFPR) — Upstate New York firm looks to crowdfunding for increased pepper production in 2014. November 25, 2013, 2:04 am (OFPR) — Altaire Productions & Publications, the Sydney-based independent arts company, proudly announces the publication of The Antigone Poems. Featuring poetry by Marie Slaight and charcoal drawings by Terrence Tasker, The Antigone Poems will be released in March 2014. November 22, 2013, 12:15 pm (OFPR) — The lovelost, an indie band, who sings in English and in Spanish have just released their new album, Foreign, to fan and critical acclaim. Ken Waters Is Moving Forward In The City Of Angels. October 8, 2013, 1:47 pm (OFPR) — Behind this average size a broad range of different growth expectations becomes visible. It reaches from a decline in production over stagnation up to growth expectations of more than 50%. September 30, 2013, 7:27 am (OFPR) — Bovada Online Poker at http://poker.bovada.lv lets you play big every day of the week. September 29, 2013, 12:24 am (OFPR) — HANDYGUYZ.com, a marketing solutions provider with a mission to drive business to local companies, is launching now in Seattle and aims to roll out to other U.S. cities in 2014. September 25, 2013, 1:42 pm (OFPR) — Arlen Van Draanen announces new Biofuels Initiative at Alternative Energy Advisors. September 24, 2013, 3:11 pm (OFPR) — The Quest Trend Magazine has analyzed the course of the worldwide industrial production in the last 30 years. Three structural changes became visible. They are forming the economic situation also these days. November 12, 2013, 11:28 am (OFPR) — Dental problems are most common in kids as well as adults. Lack of proper care and attention or neglecting tooth or gums causes dental problems. November 12, 2013, 11:24 am (OFPR) — Silver Fox, a leading UK manufacturer of labelling solutions, has reported positive results from the most recent tests carried out on its labels — for salt mist spray. November 12, 2013, 10:22 am (OFPR) — 12 November 2013, London: Public relations has joined the ranks of ancient and modern professions recognised by the City of London. The Guild of Public Relations Practitioners, founded in 2000, has been granted the status of a "Company without Livery" by The Court of Aldermen of the City of London. November 12, 2013, 9:57 am (OFPR) — Swan-Matic, a bottle capping machinery manufacturer has seen a growing trend in the electronic cigarette market, capping e-vape or e-juice squeezable dropper bottles. Submitted By: Automation Devices, Inc.
November 12, 2013, 9:48 am (OFPR) — Gourmandize.com, a new cookbook publishing website, is offering 1,000 free cookbooks as a holiday gift to its members. November 12, 2013, 9:24 am (OFPR) — Mavidea Technology Group was awarded the ShoopSHIFT Culture Award for their continual focus on company culture. November 12, 2013, 8:47 am (OFPR) — LearningAge Solutions has won a national eLearning Award for the second year running. The Awards Ceremony took place at the London Marriott Hotel Grosvenor Square on 7th November. November 12, 2013, 8:02 am (OFPR) — Beatus Co., Ltd, educational mobile game specialized app developer, has announced its launch of Kids maze ABC app on Nov. 7th. November 12, 2013, 8:00 am (OFPR) — Indian real estate is currently experiencing a dynamic boom. 'Review' and 'Complaint' forums are hence vital in minimizing the risks of investment in fraudulent traps. November 12, 2013, 7:39 am (OFPR) — As a lawyer, do you have doubts whether social media can help you grow your law practice? If yes, obviously, it can help. 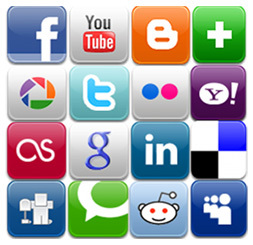 Until early 2012, social media were completely ignored by the law firms except a few highly advanced lawyers. November 12, 2013, 7:38 am (OFPR) — All the temperature monitors are effective to use and these are able to realize your different specifications feasibly. While it comes to maintain certain amount of temperature or to record it then you can prefer to TempGenius. November 12, 2013, 7:25 am (OFPR) — Nov. 12, 2013 - Miami, Florida,--United State of America. November 12, 2013, 7:02 am (OFPR) — Market Research can play a pivotal role in determining the efficacy of marketing plans. Analytical Marketing Partners make this possible with a variety of business and campaign analysis techniques. November 12, 2013, 6:57 am (OFPR) — If you are making a search for PPC management service then it is recommended that you should hire experienced and reputed company like 180 Fusion. This will make sure that time and money is utilized in better way. November 12, 2013, 6:46 am (OFPR) — Future Electronics announces immediate availability of the MIC23163 Series of Buck Regulator with HyperLightLoad from Micrel. November 12, 2013, 6:38 am (OFPR) — Agastya receives Rs. 3 crores, 10 Nexus tablets along with the support from Google to materialize their dream project into reality. November 12, 2013, 6:26 am (OFPR) — Pet lovers can now order their pet's favourite food and accessories on Facebook, Twitter and Whatsapp just to find it at their door step within few hours. November 12, 2013, 6:20 am (OFPR) — Credit Umbrella Inc. is offering $90 discount on TurboDispute Online. The offer is valid for limited time only. Submitted By: Credit Umbrella, Inc.